Bred by Canada's top oats breeder, Dr. Vern Burrows, who was a scientist for the federal agriculture department for over 50 years. 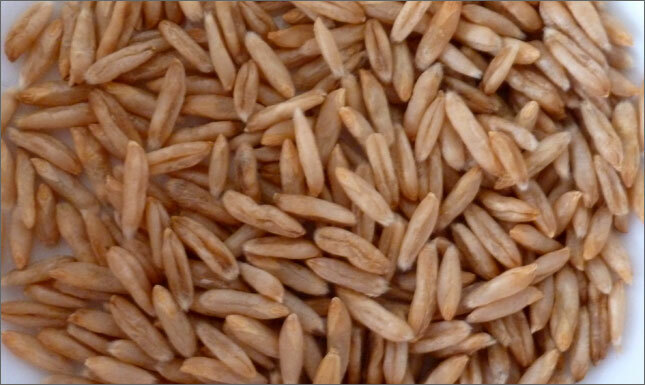 Baton has kernels that are more elongated than average oats and thresh out relatively easily. Plant in the spring, around early May, 2.5 cm (1 in) deep. A low maintenance crop which we grow in the field without irrigation or fertilization, oats pretty much take care of themselves. Harvest in early September when the seed heads turn from green to tan and you can rub the seed out into your hand. We are still working on scaling up our grain threshing, but small quantities can be processed by hand by rubbing or flailing.